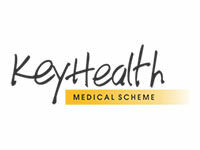 Keyhealth is an open medical aid scheme with a lineage dating back as far as the early 20th Century. The scheme maintains the values they were founded on and today continue to provide scores of South Africans with a series of comprehensive yet diverse healthcare options. Currently their member count stands at 95 000, these are 95 000 individuals who are receiving real value for money and through service excellence and dedication to their members the scheme’s member family continues to increase. Members can be rest assured that their best interests are being seen to. KeyHealth rules state that the schemes board of trustees must be voted for and elected by the members. They believe in keeping things simple which is why they provide members with easy to understand information no frill and no fuss just straight forward healthcare. KeyHealth takes great pride in all of its accomplishments the most recent being that they are one of five schemes specifically selected to provide healthcare within the South African Government. At KeyHealth the well being and quality of life of their members is something they hold dear. It is for this reason that they have seen fit to make use of all of their expertise, industry experience and partnerships with healthcare service providers to ensure members receive top of the range healthcare services at a price they can afford. KeyHealth envision a healthier South Africa by working hard to provide healthcare that is easily accessible, comprehensive and cost effective. Apart from the hard work and dedication displayed by them they approach the way they provide healthcare in a way that is unique to them, in everything they do they incorporate their motto of “Be Smart Keep it Simple”. Apart from their comprehensive range of healthcare options KeyHealth takes services delivery to the next level by providing members with additional benefits that are unique to the medical aid scheme.